It is believed that the first single lap clay roof tiles were formed from baked earth or clay around 2700 BC. The Romans were the first to make and use fired clay tiles in England but the practice died shortly after their occupation ceased. In 1212 AD King John issued building by-laws for London that required combustible roof coverings to be replaced with clay tiles. At about the same time the Archbishop of Canterbury banned the use of thatch on buildings near the Cathedral. 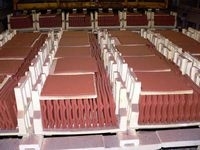 From this time clay tiles have never been out of production. King Edward IV standardised the size of a plain tile in 1477 AD. The dimensions were 10½ inches by 6¼ inches by 5/8 ths of an inch thick. 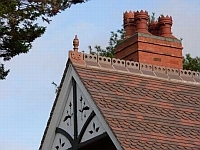 The British Standard for clay plain tiles was published in 1935 and with minor adjustments it remained in force until it was replaced by the European Standard in 1999. Britain's architectural diversity and the distinctive characteristics of villages, towns and regions has arisen as a result of local preferences and traditions and the local availability of building materials. Such historic limitations in material choice have given rise to each region’s particular style, which local planning authorities like to preserve. Dictating the general design of buildings is one way to keep new developments in character. Another is to use traditional materials that retain the aesthetic characteristics of buildings in that area. Historically, although clay tile manufacture existed nationwide where clay tile deposits were available, it was acknowledged that the strongest tiles were made in the Midlands from Etruria Marl. Traditionally, tiles manufactured in North Staffordshire were placed in the kilns in "bungs" stacked one on top of the other. This prevented the face of the tiles being exposed to the kiln gases. To obtain a colour other than red it was necessary to apply a coloured sand to the surface. 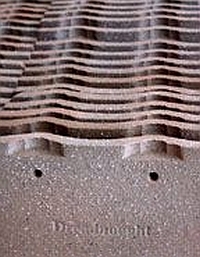 In South Staffordshire, Shropshire and the West Midlands however, tiles were set in the kiln on edge, held apart by their nibs, allowing the kiln atmosphere to react with the iron in the clay. This produced a variety of natural brindle clay colours on the tile surface, ranging from red to brown to deep Staffordshire blue. Whilst this was a more expensive method of production. the superior aesthetic qualities obtained, commanded a premium price. It is frequently not understood that precisely the same raw material is used in the manufacture of red tiles as blue tiles and that the different colours produced are wholly attributable to kiln control. The use of three nibs, instead of two, gave extra support, holding the "edge set" tiles apart when they were in the kiln and were thus important to the manufacturing process. The use of kiln furniture now makes the additional nib unnecessary. In a Clay Roofing Tile Council survey of conservation offficers, planners, architects, house builders, surveyors and roofing contractors, 99% agreed that clay tiles enhance the built environment with 95% acknowledging that they are sustainable building products. The choice of roof tile will affect both the character and value of your home. The beauty of natural clay colours is unrivalled, clay tiles mellow and improve with age. With the artificial colours that you get with concrete tiles and many types of clay tile, colour is lost with time, you just have to look at the concrete roofs of the past 70 years to observe this fact. The importance of a roof covering to the overall effect of a house cannot be underestimated and it is something that has to be right from the very start of a project as in all likelihood the the roof will be on the building for its entire life. Plain clay tiles offer superior strength and durability than all other roof coverings. Many examples exist of roofs with plain clay tiles that are still standing in pristine condition after more than 100 years. The permanence of the colour with naturally burnt clay colours guarantees that the roof will never look washed out and as it ages it will improve and mellow. The overwhelming case for plain clay tiles rests upon aesthetics. The wide range of natural burnt colours from Red to Brown to Blue can be imitated but never reproduced with artificial colouring. The permanence of artifical colours is not guaranteed. The small size of plain clay tiles provides the versatility for the architect to design roofscapes of infinite interest. Large format roof tiles simply do not offer this flexibility. Clay tile roofs form an important part of the architectural heritage of the UK. 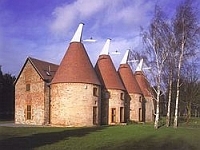 Planners and architects keen to preserve regional distinctiveness are keen to specify clay roof tiles. Plain Clay tiles are a sustainable product, the longevity of clay means that the energy and raw materials used in their production are offset over the whole life of the roof, which in the case of most clay tile roofs, is over 100 years.